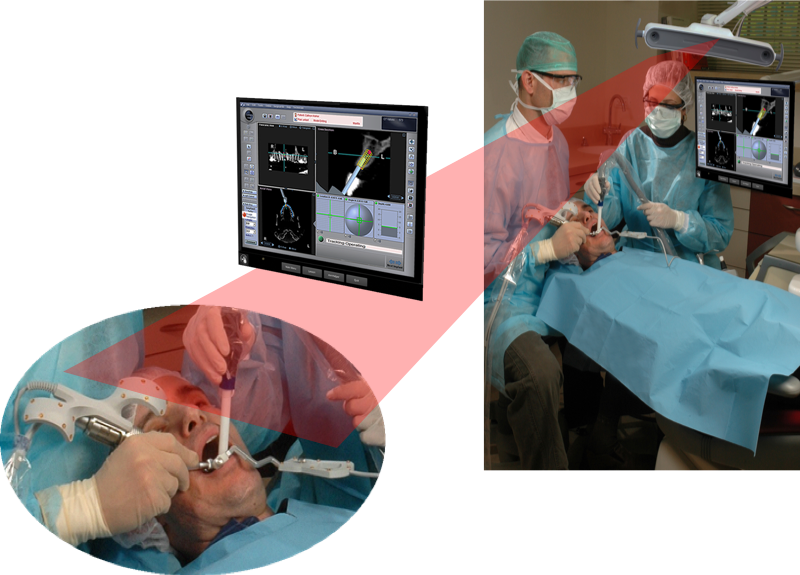 At first glance, most image navigation systems for placing dental implants look quite similar. The IGI-Image Guided Implantology navigation system is superior to competitive products in technology, ergonomics and performance. IGI’s proprietary camera and active LED (light emitting diode) tracking system were specifically engineered for dental implant surgeries. The LEDs on the IGI system work at the speed of light, with no lag or skipping, allowing one to know the exact position of the drill at all times. The majority of 3D-navigation companies use passive tracking systems that rely on a video camera to track patterns on the handpiece and patient tracker. Passive tracking systems require heavy computer algorithms for even the slightest movement, causing significant real time lag when comparing the actual drill location, angle, and depth to what is seen on the screen. 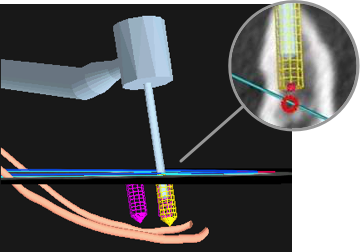 Passive tracking systems are typically utilized in other fields of medicine, where the requirement for accuracy is much less than in dental implant surgery. See this screenshot of the IGI field-of-view. The lower right array is the patient-tracker. There is no ambiguity as to the location of the handpiece or tracker. NOTE: You can test a system’s tracking fluency by dragging the handpiece from molar to contra-lateral molar. You can also test the onscreen tracking (both mandible and maxilla) by moving the handpiece abruptly from one spot to a new spot 5 cm away while looking at the screen. IGI’s proprietary wide field-of-view camera, follows your drill on-screen without losing the image during surgery. The IGI camera is also easy to reposition. Navigation surgery for dental implants: assessment of accuracy of the image guided implantology system. J Oral Maxillofac Surg. 2004 Sep;62(9 Suppl 2):116-9.Casap N, Wexler A, Persky N, Schneider A, Lustmann J. Published documentation shows that video tracking systems have deviations in their drill locations of more than 3 millimeters; with one of these systems having an average deviation of more than 2 millimeters. The IGI patient-tracker is small, flat and out-of-the-way. This is a distinct advantage over other systems that have a fixed-position camera, and a barrel-shaped or large patient-tracker that can block your hands from a normal working position. IGI is the optimal system for dental implantology.